Each one of our tamales is hand made by hispanic ladies who grew up in the Mexican Culture. Our ladies learned how to make tamales in Mexico at an early age. Now they live in Texas and are sharing their tamale tradition with our customers. 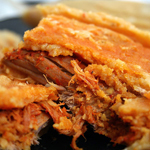 We gurantee that you'll love our pork tamales. If you love cheese, we also have "Pork and Cheese" Tamales. We make our tamales every day. 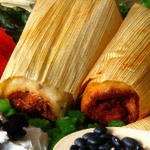 Remember that a dozen pork tamales are the perfect menu addition to any holiday party or special event.